Inquiring minds are digging into the July 2009 Opinion Survey on Bank Lending Practices. 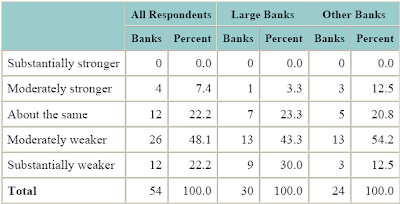 The survey shows that bank lending standards continue to tighten at varying rates by loan category. 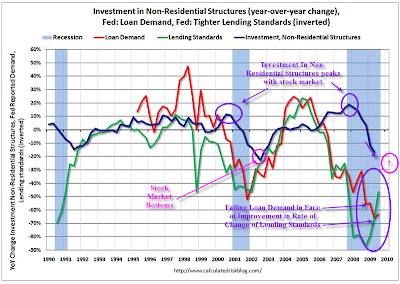 Calculated Risk discussed the survey in Lending Standards Tighten, Loan Demand Weakens. Here is a chart from the article. The annotations in pink and purple and the thoughts below are mine. Interestingly, the last two recessions began just as investment in non-residential structures peaked. The stock market peaked at the same time. Note that investment continued to decline long after the last recession was over. Also note when the stock market bottomed following the last recession. Are we in for a repeat? In regards to investment, odds are high we are in for a repeat (if not something much worse). The stock market? You tell me. What I will suggest is the stock market is 50% overvalued at this point. I vote for door number 3, but any scenario is possible. 9. Apart from normal seasonal variation, how has demand for commercial real estate loans changed over the past three months? Demand for commercial real estate loans is still collapsing. Massive overcapacity and weak consumer demand are the two key reasons. Commercial Real estate was a massive driver for jobs in the post-2000 recession. Think of all the retail stores that were built: Walmart (WMT), Target (TGT), Home Depot (HD), Lowes (LOW), Walgreen (WAG), Nordstrom (JWN), Abercrombie & Fitch Co. (ANF), etc. Think of the grocery store buildout that followed the buildout of residential subdivisions: Safeway (SWY), Kroher (KR), Whole Foods (WFMI), and Osco-Jewel & SuperValue (SVU). Now think of all the merchandise it took to fill those stores and the trucking (and trucking jobs) involved to keep stores stocked for consumers whose demand was thought to be insatiable. Grocery store demand is still present given that people have to eat. However, the demand for new stores (and new hires) isn't. As for the rest of the retail sector, it's as I said on April 18, 2008: Shopping Center Economic Model Is History. Currently we are in the midst of the Worst Performance Ever For Back-To-School Sales. Expect Christmas season to be miserable again. Consumer demand is dead. That demand is not coming back anytime soon, and there is no driver for jobs if it doesn't. Pray tell what happens if GDP can't exceed 2.5% for a couple of years? What about a decade (or on and off for a decade)? If you have come to the conclusion that we are going to have structurally high unemployment for a decade, you have come to the right conclusion. Ask yourself: Is that what the stock market is priced for?